Click here to go to my channel. Additional videos at the bottom of this page. 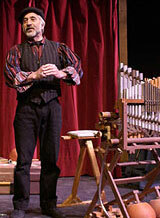 Classically trained musician, inventor, and one-man-orchestra Len Solomon performs a unique recital of music and comedy. 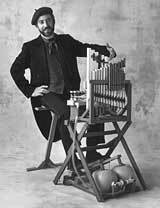 The one-hour show features your favorite symphonic compositions, arranged for Dog Whistles and Bicycle Horn, plus a chromatic pipe organ devised from plumbing parts and coat-hanger wire, and of course, the ingenious Majestic Bellowphone: a musical masterpiece of Medieval technology! The Bellowphone Show has been bringing music and laughter to audiences in this country and abroad for over 25 years. 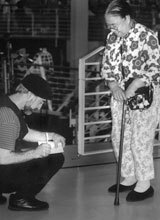 Len and his creations have appeared several times on national television, in venues from Jordan Hall, Boston, to theatres in Singapore and Japan. Len majored in guitar and early music at Antioch College, and followed that with two years of playing guitar in a country-rock band in Idaho. He finally gave up the glory of playing for drunkards in bars five nights a week, and went to work for 10 years as a professional cabinetmaker in the Boston area. 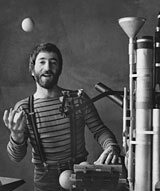 In 1983, in his Cambridge basement, Len built the Majestic Bellowphone, and he took it to the streets along with his 5-ball juggling routine, taking his place among the ranks of classic Harvard Square street acts. In 1991, Len gained national recognition as a featured performer in PBS' Lonesome Pine Specials' One-Man Band Extravaganza, taped at the Kentucky Center for the Arts in Louisville. 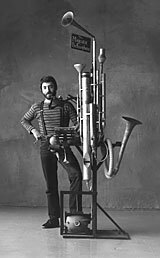 In 1998 Len appeared in "A Taste of Passover" in Jordan Hall, Boston, which was also broadcast on national TV; he performed 22 shows in a week-long Festival of the Arts in Singapore; was invited back to the Kentucky Center for the Arts for a return engagement, and that year was also featured on the experimental music CD “Orbitones, Spoon Harps and Bellowphones”. The following year he was back at Jordan Hall to perform his comedy in the filming of "A Taste of Chanukah" and then he was off for the 2-week Tempozan Festival in Osaka, Japan. 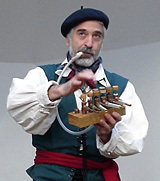 Len performed as the "Mad Minstrel", one of the daily acts at King Richard's Faire in Carver, MA in the fall of 2006 and 2007. He also appeared for several years' running as the "Phenomenon", in the Revels Repertory Company's touring production of "There's a Meeting Here Tonight!" A lively version of the old classic, performed on the Callioforte.